Best Piece of D&D Art, Ever! I’ve been fighting the urge. I really have. I put this up on my twitter account the other day, and swore that I wouldn’t bring him over to the blog. I fought it so hard, but ultimately, the power of breakdance and boombox is too strong, too persuasive. I invite you now to name this guy. I think he’s a gnome, maybe a halfling, I don’t know. I know he’s all jive, mutha! From The Book of Wondrous Inventions, art by Jim Holloway. C 1987 TSR. After seeing this on twitter, I am so glad to see him on your blog. I think the internet has a new mascot. Isn’t this the notorious freelancing gnome bard/monk, Mr. Brei-Kahm Ove, last seen at the count of Sir Dancealot? I thought I was the only person with a copy of this golden book. Some of the content is just hilarious. Oh no sir, who can forget the cash dispensing atm, designed by current head of rpg design at wizards, Bill Slaviscek? 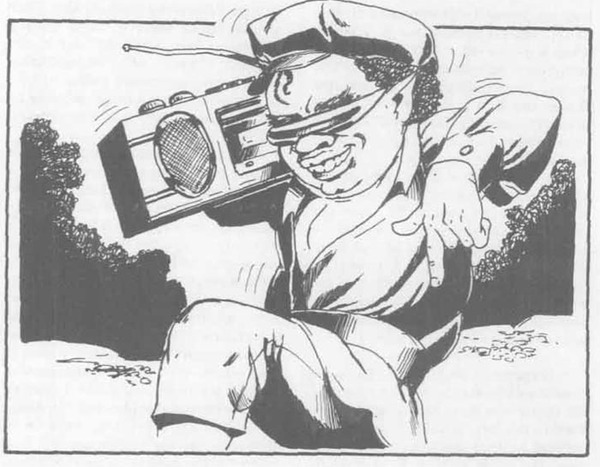 Remember everybody: The Boombox is not a toy.